← The real marriage of figaro! The majority of our audience is coming to us through word of mouth, and through on-line marketing. This is terrific on one hand, as neither realm of marketing is terribly costly, however, if we are going to grow, we need to continue to spread the word OUTSIDE of our current sphere of influence. We need to continue to find ways to motivate our patrons to bring friends! We know that many of our patrons would prefer to call our box office and speak to a human being. That said, we are bound to using on-line ticketing vendors until our funding supports having regular staff. We are exploring options, however, for other ticketing vendors, and hope to have news regarding our progress in the coming days. 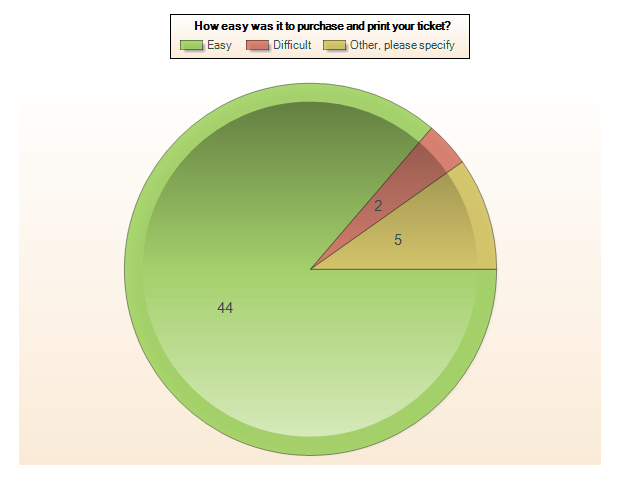 On-line ticketing offers us the convenience of not having to staff a box office full-time, and offers the consumer the convenience of being able to purchase their tickets on their own schedule. We will never turn away someone without internet access! If you have trouble with the ticketing mechanism, give us a call, and we’ll get back to you as soon as we can! This may be the most important piece of information in our survey, and I am thrilled at the response. Do not worry, we’re not going to run right out and raise the prices because of it! We are committed to presenting a value oriented product, and we are thrilled that the majority of our patrons recognize this. 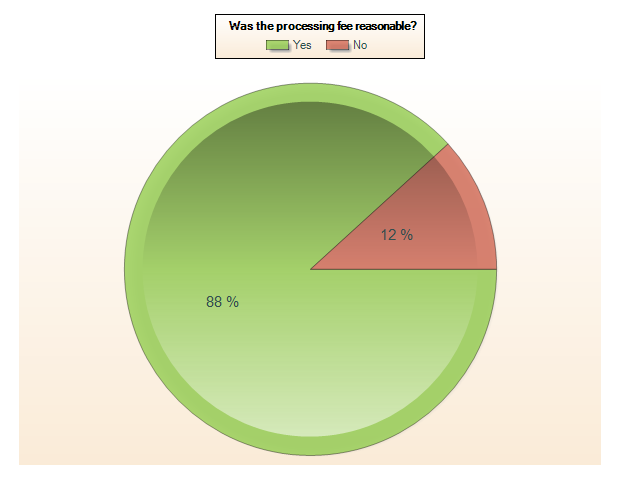 This one is a little tougher to swallow, as 12% of our patrons didn’t think that the processing fee was reasonable. I don’t like it either, but it is a reality in the business, and our processing fee is far less than you would expect to pay at other box offices. TICKETMASTER can charge up to 20% of the ticket price in processing and handling fees. Again, in an ideal world, we would have a full-time staff that could handle your ticket orders, and we’d receive so much private and government support that the costs if that staff would be covered, but we’re not there yet…and we beg your indulgence until we get there. 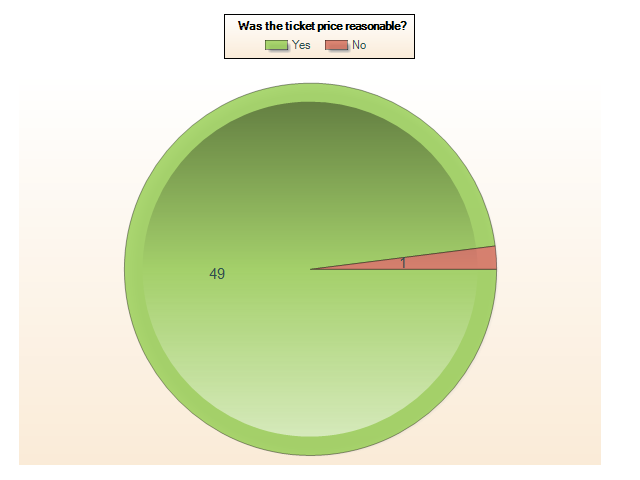 We did have some comments on the survey, wishing that the service fees were spelled out prior to check-out, and this is certainly something we can look into. 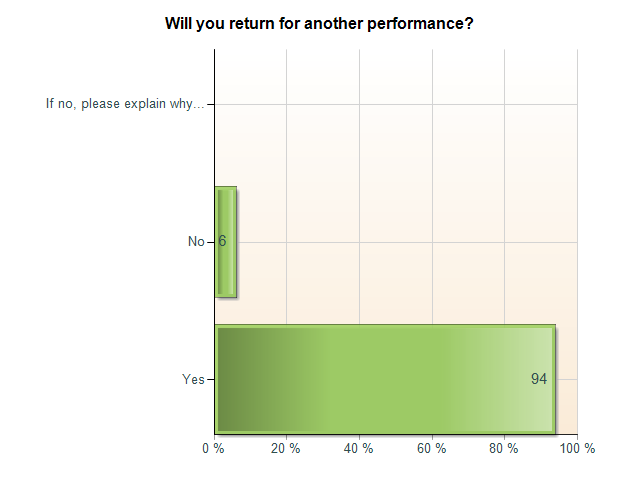 To me, it is unacceptable that 6% will not return, but after further review of the comments offered, we can understand why. Those of you that were there, know that this old building has its challenges in the heating/cooling department. Even though the ballroom has already undergone extensive renovations in that department, we realize that there are still some issues “in between” heating and cooling season. Of the 6% that will not return, all but one blamed it on the temperature. Although this is not something that we can control, we plan to work with the club to determine if March performances are feasible, and worth the risk. Those of you that made it to FAUST, know that they have the capacity to cool the room down, we had several complaints then about it being too cold! We’ll continue to work it out, and continue to trust that even with the temperature issues, we have a truly exceptional venue, for which we are most grateful. This is another very telling statistic. 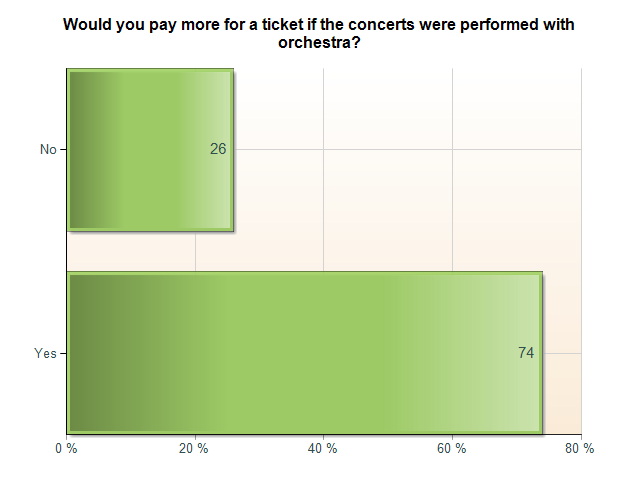 Although we are excited to know that 74% would pay more for a ticket with orchestra, this causes us to move forward with that idea cautiously. If we were selling out every performance months in advance, and 95% would pay more for performances with orchestra, well…we’d plow ahead quickly! We love our orchestral colleagues, and hope to have them involved soon…but not at the risk of wiping out what we have built. We will not proceed with an orchestra concert, until we are confident that we can sell out a larger venue, and slightly higher ticket prices. If and when we proceed with orchestra, it will be in addition to our full season at the Engineers Club. Large glass doors need curtains to block out the light during Sunday performances. indeed they do! We were fortunate enough during the matinee for FAUST to have curtains available to us that were left over from a wedding, and had not been picked up….honestly, we never gave it another thought, because it hadn’t been a problem. We’ll investigate some room darkening curtains for A Flight of Verdi. I would too, but I am skeptical that we’d be able to do that in our current format. One of the reasons that we are able to get the talent that we get, for the money we have, is that we have very few rehearsals. Any added elements would present the need for more rehearsal. We’ll certainly look into “semi-staged” pieces in subsequent seasons, but we don’t expect to get there next year. Well, that is a matter of interpretation, and taste. Actually, the literal translation is indeed correct, but I see your point that “The latter loses all the tempestuous anger and drama of the original Italian and Santuzza’s anger.” Our Supertitle library is a great asset to us, and something that we rescued from the Baltimore Opera Company bankruptcy auction. Most of these titles were prepared by a dear friend and mentor who is dearly missed, and who I still will not question when it comes to translation, performance practice, or tradition….even years after his death. The dinner is indeed handicapped accessible, we just need to arrange with the club, the use of the elevator. Many apologies for failing to get that word out. Please do contact us in advance next time, and we will make sure that we make arrangements for you. These are all things which we can learn from, and we thank you for taking the time to take our survey! Please continue to stay involved, and we look forward to seeing you in APRIL for SO YOU THINK YOU CAN SING OPERA! 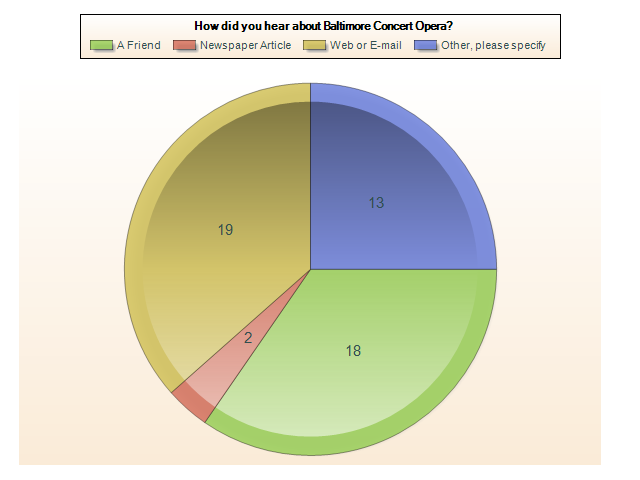 This entry was posted in Uncategorized and tagged Baltimore Concert Opera, Brendan Cooke, Cavalleria Rusticana and Pagliacci, Engineers Club, Survey results. Bookmark the permalink.